ScrappyCamperSisters : Come Clean 2016 - February was Flowers! 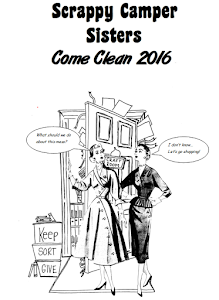 Come Clean 2016 - February was Flowers! Use your card stock and flowers, dies and ephemera and make what we are calling Journal Toppers. They are self-contained, you can make them ahead and add to a journal cover, mini-album or even a card. They make a great gift, too!